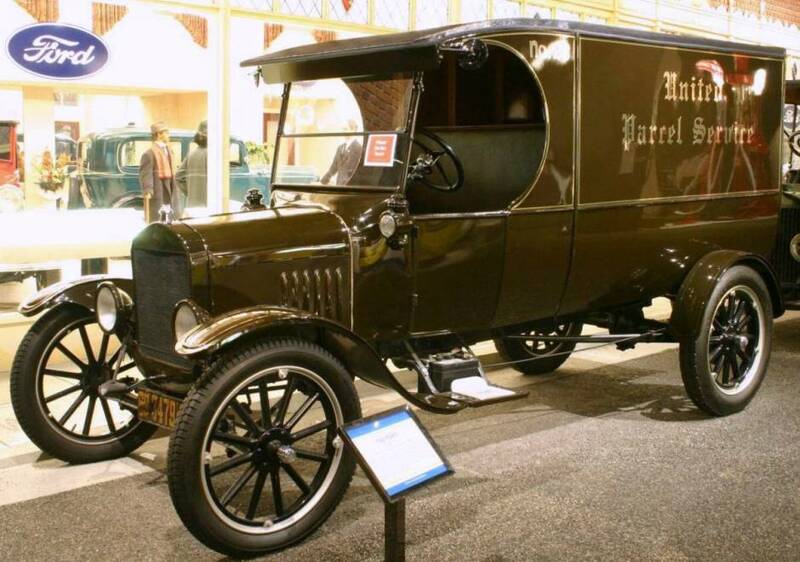 Model T Ford Forum: 1923 C-Cab Delivery Body? 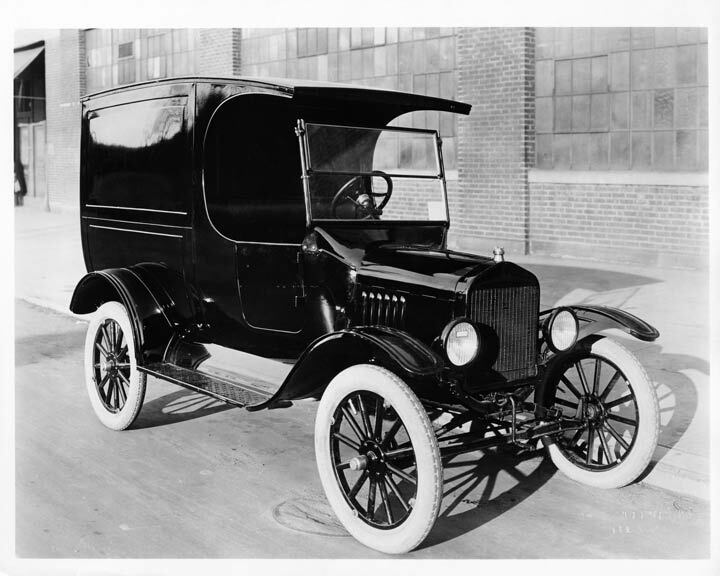 Model T Ford Forum: Forum 2018: 1923 C-Cab Delivery Body? I'm not certain but I believe this is a Ford Motor Company photo from 1923. It show a C-cab style Delivery body. Is this a prototype that was never produced or what? Does anyone know anything about this? The second photo is a restored example of a Model TT Truck with a very similar looking body. Does it have an accessory body, or what? I see one big difference: The first body is on a car chassis while the second body is on TT chassis. I don't know if that makes a big difference in your question or not. This is a prototype made for Ford by Budd Manufacturing. Budd built many of these as a marketing tool for the larger truck builders such as Ford Dodge International ect.. This photo is missing the date that would have been in the upper right hand corner. My experience says that this was built in either 1921 or 1922. Thanks Fred, That's a good explanation for the first photo. I'll see if maybe I can find a manufacturer close to this style in my records. It definitely is not Budd but one clue could be that UPS was started in Seattle so the body builder might have been close to there. George Heiser Body Company in Seattle started as a wagon builder. They are still in business today assembling pre made aluminum bodies for trucks. I tried to research a Pie wagon they had possibly manufactured. Sadly all old records have been purged and no information available. UPS did in fact start in Seattle and I would think the trucks were made locally. I noticed a couple of things about this UPS struck, drum headlights, disc wheels, non Ford rear fenders and some sort of accessory radiator cap. What is under the right front fender, almost like a additional axle support?? OK, something a little of track but in line with prototype and something for the Ford historians to ponder on. A USA published Encyclopedia on Commercial vehicles. 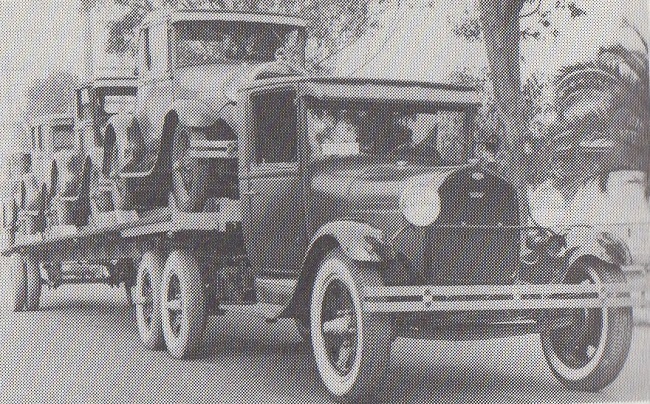 In 1926 Ford commissioned a prototype TT 3 ton forward control truck with twin axle rear wheels. And shared the same name as the tractor, Fordson. It never saw production but the Model AA used the same rear wheel configuration later for trailer pay loads. 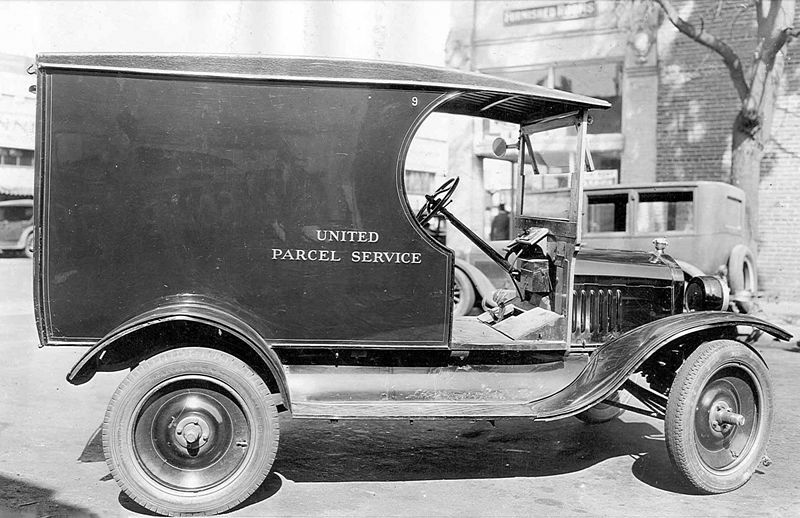 Rick the style reminds me of a Chevrolet body but I don't have any others that match this delivery car. Martin Parry did have a shop in Seattle around this time though. It could have come from them or many other body companies. Frank -- I did see the posting at: http://www.mtfca.com/discus/messages/118802/153891.html which has a 2-Ton Fordson based on the Fordson tractor engine. The link shows a chassis without the body. As well as some TT's that were a prototype with the 1926 style hood, cowl, and front fenders. It sounds like you are referring to a different one -- I.e. with twin rear axles. I have seen mention of conversions for the 1928-1931 Model AA Ton trucks some converted to a twin rear axle some with and others without both axles powered. (Ref pages 76, 77, and 86 of James K. Wagner "Ford Trucks Since 1905). Those were outside suppliers converting the A Ton Truck chassis with an extension and additional axle -- not Ford. But I don't remember seeing a TT with the two rear axles. I don't have time to look -- but from memory (not that great) I don't recall one. I do recall several with frame extensions and heavier springs to up the pay load. Perhaps someone can post a photo or a link to one? On page 82 in Henry's Wonderful Model T is a pencil sketch of a truck using the Fordson power plant, dated 9-20-20. It only had a single rear axle. So part of the idea pre-dated 1926. Got a photo of the AA with duel axles, the TT might be a bit more elusive. Thank you both for the additional information. Frank -- your photo above looks familiar, but I'm not sure where I saw it. 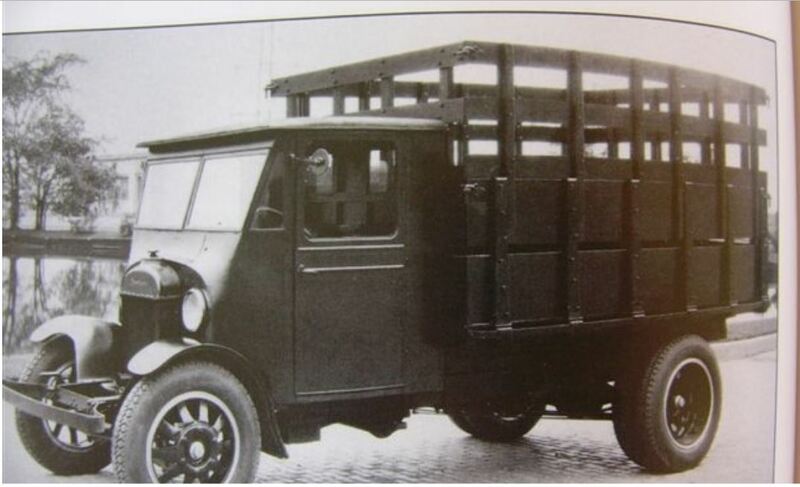 The reference above pages 76, 77, and 86 of James K. Wagner "Ford Trucks Since 1905" also show a dual rear axle AA. With more and more items coming to light -- one or more may show up. But I do not think Ford USA went into production with them. At least I don't recall every reading that one. For Fred -- I wonder if Ford requested Budd to build a prototype or if Budd produced it with the hopes of having Ford purchase it for their use? Budd built a prototype "All Steel Fordor Sedan" in 1928 with the hope of getting Ford USA to decide to put the body into production. It did not persuade Ford. But Ford USA continued to purchase the wood skeleton framed Fordors from both Murray and Briggs but not from Budd. Ford went to an all steel (still had some wood for upholstery and the top) Fordor & Town Sedan bodies with the late 1931 Slant Windshield bodies. Budd became a Ford body supplier in 1921. Hap, Budd built prototypes for many companies as a show piece to gain a contract. These contracts were handshakes back then. I have quite a few truck and car prototype photos that were made for Ford. The only ones that made production that I know of are the Model TT enclosed and the 1926 all aluminum Fordor. I do have the TT open cabs also. To my knowedge Budd never received money to build prototypes this was just how they advertised their patented all steel bodies. Many auto companies stayed away from all steel bodies mainly because of their higher price tags. Eventually all auto manufacturers went with the Budd style in order to produce more vehicles as they could be painted and baked much quicker because there was no wood used. I forgot to say that the first photo is a Budd Manufacturing prototype as it has the Budd embossing in the lower right corner. The 2 Ton truck in the photo here from Hap, was a joint venture between Budd and Ford with the chassis and Drive train designed by Gene Farkas and the body was designed and manufactured by Budd. I can't remember exactly how many of these 2 Tons were built but it was at least six. Thank you so much for adding the additional details about the Budd body company and how they did they would produce a prototype to help convince the car company to purchase their body. And it sounds like you might have enough information and photos to make up an article for the "Vintage Ford" magazine. If you are not an author -- that's not a problem. If you prepare a draft -- there are folks that can review and help mold it into an article. And for many things if you just tell the story to someone -- that story often can make a great article. You have some interesting photos and background on some of the Model T bodies that were prototypes. I would encourage you to consider scanning them and making the scans available to the Bruce McCalley Memorial Library & Research Center located at our MTFCA Museum. We are all going to eventually leave our "stuff" and someone else will distribute it. We can leave our desires and directions about how we would like it distributed. And that is helpful. But we can sometimes do some of that distribution while we are still here. By scanning the information and sending it to the MTFCA -- you increase the odds that the information will not be inadvertently lost when you depart. It also takes care of backing up the information against loss in case of fire or natural disasters. Note the Benson Ford Archives fire last century destroyed lots of items -- and many of those were only available in that one location -- so they are gone. Again, thank you so much for the additional information.